Recent technological advances enable us to collect huge amounts of data from multiple sources; however, extracting meaningful information remains to be the main challenge. In complex problems, the structure we are looking for is often buried in the data. In those cases, in particular, looking at the data from different aspects; in other words, jointly analyzing data from multiple sources, i.e., data fusion (also called multi-block, multi-view or multi-set data analysis), increases the chances of capturing the hidden dynamics. 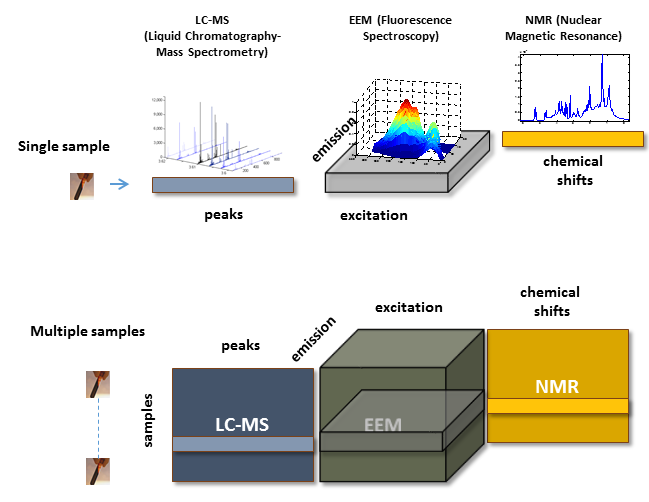 For instance, in metabolomics, biological fluids are measured using a variety of analytical techniques such as Liquid Chromatography-Mass Spectrometry (LC-MS), Gas Chromatography-Mass Spectrometry (GC-MS) and Nuclear Magnetic Resonance (NMR) Spectroscopy with an ultimate goal of identifying chemicals related to certain conditions such as diseases. Data measured using different analytical methods are often complementary and their fusion enhances knowledge discovery. This project focuses on developing mathematical models/algorithms for data fusion. We apply the developed methods in different domains including metabolomics, neuroscience and social network analysis. Common and Distinct Components in Data Fusion (A. K. Smilde, I. Mage, T. Naes, T. Hankemeier, M. A. Lips, H. A. L. Kiers, E. Acar, and R. Bro), Journal of Chemometrics, 31: e2900, 2017. Structure-Revealing Data Fusion (E. Acar, E. E. Papalexakis, G. Gurdeniz, M. A. Rasmussen, A. J. Lawaetz, M. Nilsson, and R. Bro), BMC Bioinformatics, 15: 239, 2014. A Flexible Modeling Framework for Coupled Matrix and Tensor Factorizations (E. Acar, M. Nilsson, and M. Saunders), EUSIPCO, 2014. Understanding Data Fusion Within the Framework of Coupled Matrix and Tensor Factorizations (E. Acar, M. A. Rasmussen, F. Savorani, T. Naes, and R. Bro), Chemometrics and Intelligent Laboratory Systems, 129: 53-63, 2013. Optimal Weight Learning for Coupled Tensor Factorization with Mixed Divergences (U. Simsekli, B. Ermis, A. T. Cemgil, and E. Acar), EUSIPCO, 2013. All-at-once Optimization for Coupled Matrix and Tensor Factorizations (E. Acar, T.G.Kolda, and D.M. Dunlavy), KDD Workshop on Mining and Learning with Graphs, 2011. Forecasting Chronic Diseases using Data Fusion (E. Acar, G. Gurdeniz, F. Savorani, L. Hansen, A. Olsen, A. Tjønneland, L. O. Dragsted, and R. Bro), Journal of Proteome Research, 2017. New Nordic diet versus average Danish diet: a randomized controlled trial revealed healthy long-term effects of the new Nordic diet by GC-MS blood plasma metabolomics, (B. Khakimov, S.K. Poulsen, F. Savorani, E. Acar , G. Gürdeniz, T.M. Larsen, A. Astrup, L.O. Dragsted, and S.B. Engelsen), Journal of Proteome Research, 15(6): 1939-1954, 2016. Data Fusion in Metabolomics using Coupled Matrix and Tensor Factorizations (E. Acar, R. Bro, and A. K. Smilde), Proceedings of the IEEE, 103: 1602-1620, 2015. Structure Revealing Data Fusion Model with Applications in Metabolomics (E. Acar, A. J. Lawaetz, M. A. Rasmussen, and R. Bro), IEEE EMBC, pp. 6023-6026, 2013. Patterns of time since last meal revealed by sparse PCA in an observational LC-MS based metabolomics study, (G. Gurdeniz, L. Hansen, M. Rasmussen, E. Acar, A. Olsen, J. Christensen, T. Barri, A. Tjønneland, and L.O. Dragsted), Metabolomics, 9(5): 1073-1081, 2013. Coupled Matrix Factorization with Sparse Factors to Identify Potential Biomarkers in Metabolomics (E. Acar, G. Gurdeniz, M. Rasmussen, D. Rago, L. Dragsted, and R. Bro), International Journal of Knowledge Discovery in Bioinformatics, 3:22-43, 2012. Coupled Matrix Factorization with Sparse Factors to Identify Potential Biomarkers in Metabolomics (E. Acar, G. Gurdeniz, M. Rasmussen, D. Rago, L. Dragsted, R. Bro), ICDM Workshop on Biological Data Mining and its Applications in Healthcare, pp. 1-8, 2012. ACMTF for Fusion of Multi-modal Neuroimaging Data and Identification of Biomarkers (E. Acar, Y. Levin-Schwartz, V. D. Calhoun, and T. Adali), EUSIPCO, pp. 643-647, 2017. Tensor-Based Fusion of EEG and FMRI to Understand Neurological Changes (E. Acar, Y. Levin-Schwartz, V. D. Calhoun, and T. Adali), IEEE ISCAS, pp. 314-317, 2017. Incorporating Higher Dimensionality in Joint Decomposition of EEG and fMRI (W. Swinnen, B. Hunyadi, E. Acar, S. Van Huffel, and M. De Vos), EUSIPCO, 2014. Link Prediction in Heterogeneous Data via Generalized Coupled Tensor Factorization (B. Ermis, E. Acar, and A. T. Cemgil), Data Mining and Knowledge Discovery, 29(1): 203-236, 2015. Link Prediction via Generalized Coupled Tensor Factorisation (B. Ermis, E. Acar, and A. T. Cemgil), ECML/PKDD Workshop on Collective Learning and Inference on Structured Data, 2012. Coupled Analysis of in Vitro and Histology Tissue Samples to Quantify Structure-Function Relationship (E. Acar, G. E. Plopper, and B. Yener), PLoS One , 7(3): e32227, 2012. T33. Steno Diabetes Center, Copenhagen, Denmark, October 5, 2016. T32. 13th NuGOweek: Phenotypes and Prevention - The Interplay of Genes, Life-style factors and Gut Environment (Copenhagen, Denmark), September 5-8, 2016 (Invited Talk). Mini-workshop on data fusion methods and applications, August 12, 2015, University of Copenhagen, Frederiksberg C, Denmark. This work is funded by the Danish Council for Independent Research | Technology and Production Sciences and Sapere Aude Program under the projects 11-116328 and 11-120947.